Writing girls into history - by launching our own series of books for young readers. We love meeting our young readers and personally inscribing their books for them. 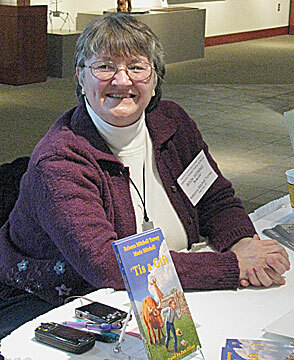 First Kentucky Girls Book debuted in December 2009. Public distribution began in the village that inspired it. Road to Pleasant Hill, was released in December 2009. `Tis a Gift, was released in November 2010. If your local book sellers don't have them in stock, tell the managers they can be ordered from MotesBooks, our publisher, or from Ingram Distributors. you can buy them online from Amazon.com, or Barnes & Noble, or directly from MotesBooks. If your organization would like us to attend an event it's sponsoring, don't hesitate to ask. 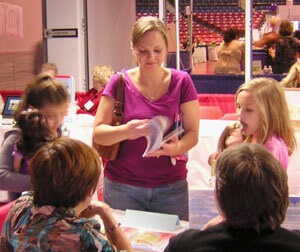 We enjoy working with bookstores, schools, libraries, scout troops, and other organizations serving young girls. 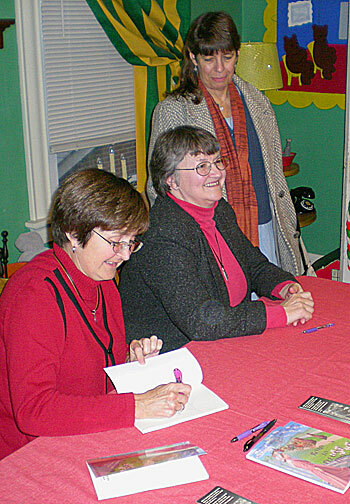 Dec. 5, 2009 - Co-authors Marie and Rebecca and illustrator Pam (left to right above) celebrated the official release of their new novel by autographing books for visitors to the Shaker Village where the story takes place. 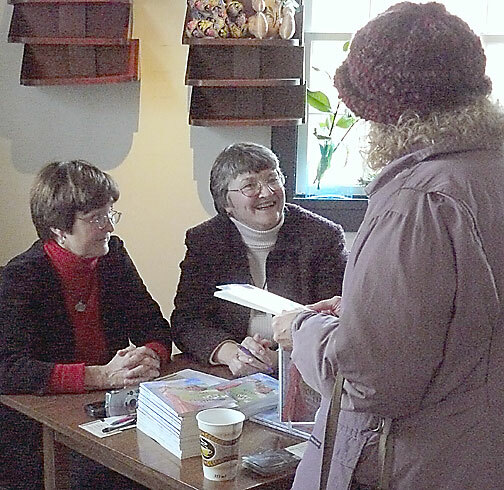 The book signing, a part of Shaker Village's "Simple Gifts of Christmas" festivities, was a rousing success. 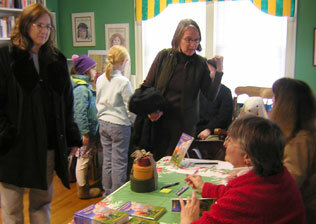 It was a wonderful time to meet both young and mature readers and personally sign their books. 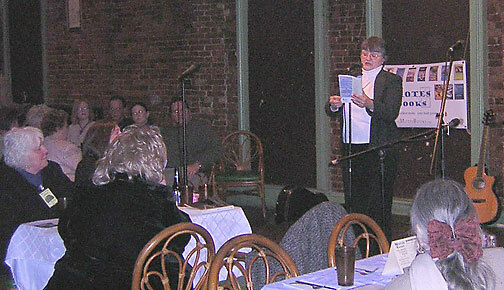 Dec. 10, 2009 - The authors were among the special guests lauded at the 2009 annual literary dinner hosted by MotesBooks at the Rudyard Kipling Restaurant. It was a wonderful opportunity for Rebecca, Marie and their husbands to meet and mingle with Kentucky authors and editors. 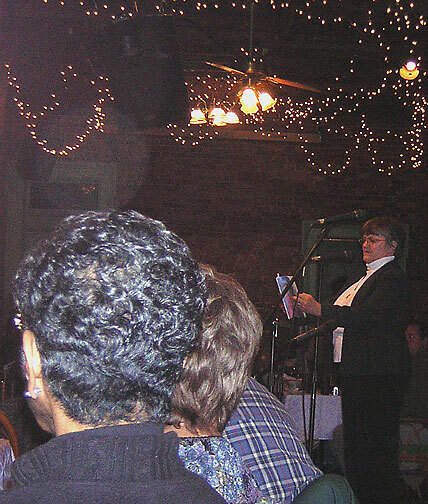 During the recognition program following dinner, Rebecca read the first chapter of Road to Pleasant Hill. 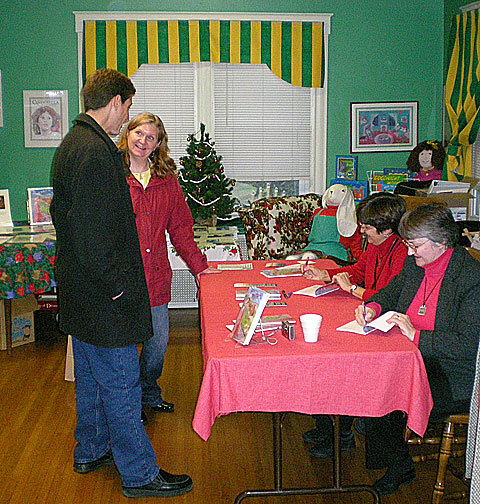 Dec. 12, 2009 - Christmas decorations and tasty treats added a festive air to The Blue Marble the afternoon co-authors Rebecca and Marie along with illustrator Pam stopped in to sign copies of their recently released Road to Pleasant Hill. The Blue Marble has long been the premier children's bookstore in the Northern Kentucky/Greater Cincinnati area. 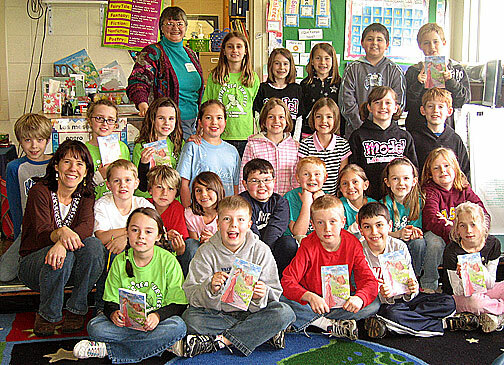 March 26, 2010 - Rebecca and teacher Jennifer Green pose with her third-grade class which was reading and studying Road to Pleasant Hill at the time Rebecca and Marie came to their class. In addition to talking with the class about this book and answering their questions about Betsy's adventures, Rebecca and Marie discussed the general process of writing and publishing a book and carefully highlighted the distinctions between novels and non-fiction books. 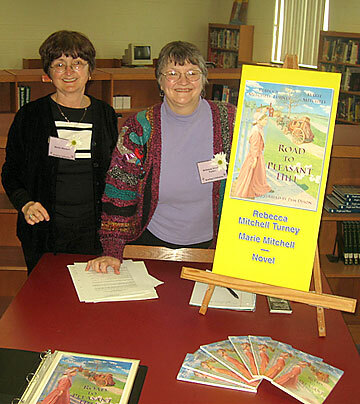 March 27, 2010 - Rebecca and Marie joined other Kentucky authors to sign their books and chat with readers of all ages on "Authors Row" at Estill County's Celebration of Reading. The annual event attracted scores of young readers, teachers, and families who came to meet the authors and discuss their books. This year's theme was "If you give a mouse a book ...," a tongue in cheek tribute to the ever-popular children's book "If You Give a Mouse a Cookie ..." Rebecca was particularly delighted by this theme because she used to read that book to her own daughter. 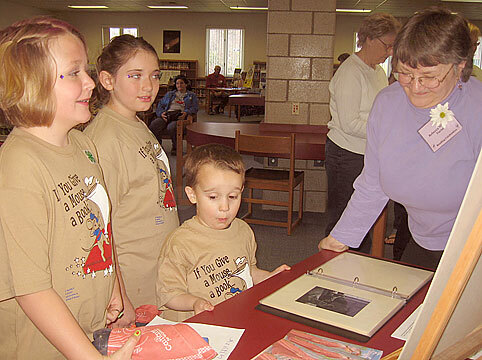 Above left: Rebecca shows readers wearing event-themed t-shirts a scrapbook prepared by Pam, the book's illustrator. 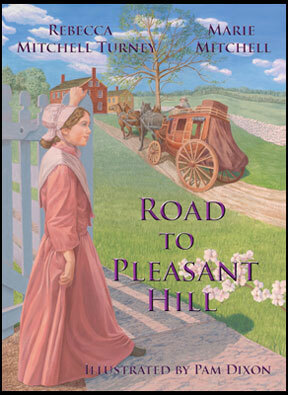 It compares actual photos of the Shaker Village with the illustrations she drew for Road to Pleasant Hill. 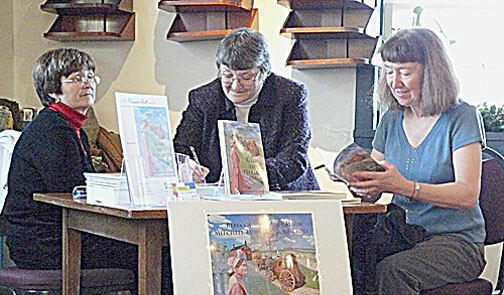 Above right: Marie and Rebecca stand at their assigned table. 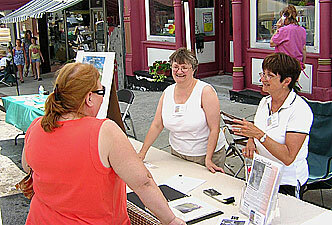 June 26, 2010 - It was beautiful, bright and sunny, but oppresively hot and humid, when Rebecca, Marie and Pam joined some 50 other Kentucky authors and artists on Main Street in Harrodsburg. 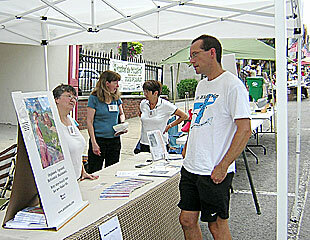 Tents and tables spanned two city blocks in the downtown business district, for the city's first Festival of Books and Arts. It was nice to sign and sell some books, but it was even nicer to visit with eager readers and interested teachers and discuss mutual concerns with other aspiring writers and artists. 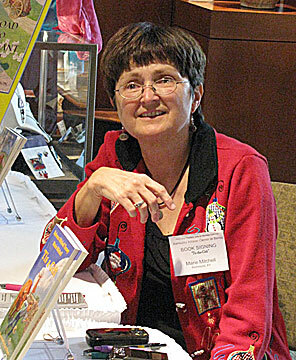 Sept. 17, 2010 - The book signing was only one of many activities included in this four-day conference for Kentucky librarians and school media specialists. Titled "In These Extraordinary Times: Libraries Now More than Ever," it drew hundreds of participants from schools and public libraries all across the state. They came to learn, exchange ideas, share experiences, and socialize. For Rebecca, Marie, and Pam, who were among the invited authors and illustrators, it was a wonderful opportunity to meet teachers and school librarians who have daily contact with potential readers and to explore the possibilities of future school visits. 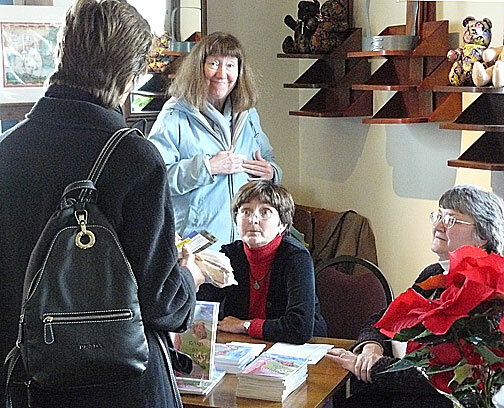 At right: Pam and Rebecca get contact information from one of the many participants who stopped by their table in the book signing area. Wow! -- The World Equestrian Games! 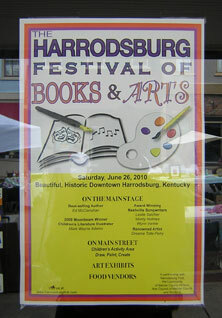 Our book was chosen as an example of Kentucky arts and crafts. Sept. 25 - Oct. 10, 2010 - This was the first time the World Equestrian Games -- an Olympic-style event for horses and riders -- were ever held in the United States, and the Kentucky Horse Park in Lexington was the host. Tens of thousands of people and hundreds of champion horses from around the world attended the two weeks of competitions. It was a marvellous chance to showcase Kentucky to the world, so it included an on-site sales outlet for selected Kentucky-made products and artistic creations. We were thrilled that Road to Pleasant Hill was among the books chosen to be sold here. Oct. 30, 2010 - Hundreds of K-12 educators from across the state gathered in Lexington for this annual three-day conference devoted to improving the reading skills of Kentuckians. 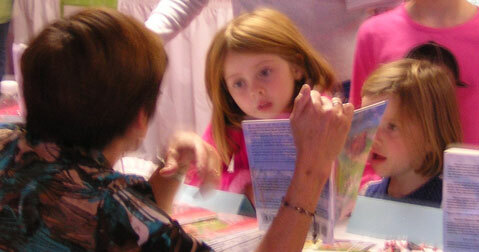 Saturday's sessions focused on authors and their books. 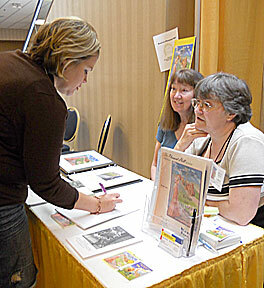 During the morning, Rebecca, Marie, and Marie's husband Mason Smith shared a display table where they met and talked with conference participants and promoted the Kentucky Girls Books and the additional children's titles co-authored by Marie and Mason. 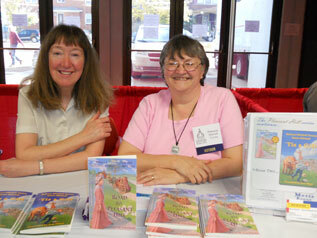 Then, at the special "Meet the Authors Luncheon," they served as table hosts and led informal discussions. 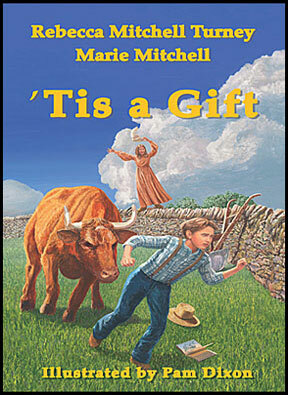 Nov. 13, 2010 - Kentucky's grandest and most popular annual book event -- The Kentucky Book Fair at the Frankfort Convention Center -- was a wonderful place to start selling `Tis a Gift. 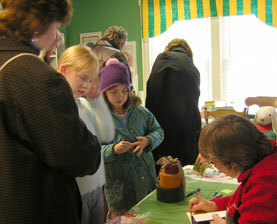 It attracted almost 200 authors and an estimated 4,000 visitors. 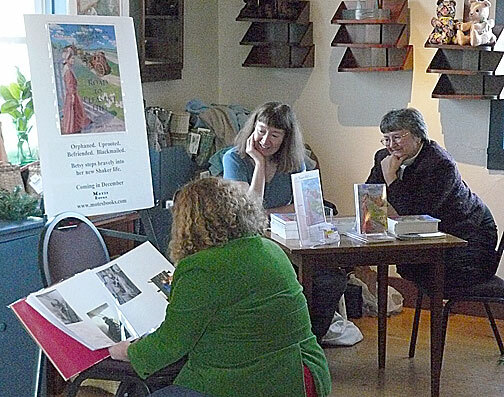 The all-day event was an exciting and stimulating chance for authors and readers to meet and discuss their favorite topic -- books. Rebecca, Marie, and Pam all had a wonderful time catching up with old friends and meeting lots of new ones. 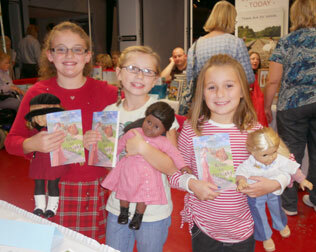 Among them were several girls who brought their American Girls dolls to the Book Fair to attend a special American Girls tea. These girls love reading American Girls books but hadn't even known there were Kentucky Girls Books until they came to the book fair. They seemed delighted to learn about them and eagerly bought copies so they could read about the adventures of Betsy Johnson and her new Shaker friends. We also met some boys who were happy to learn that our books aren't just for girls but also include some strong male characters. `Tis a Gift, for instance, pays particular attention to Betsy's younger brother Tad who saved her life when she became trapped in the woods. 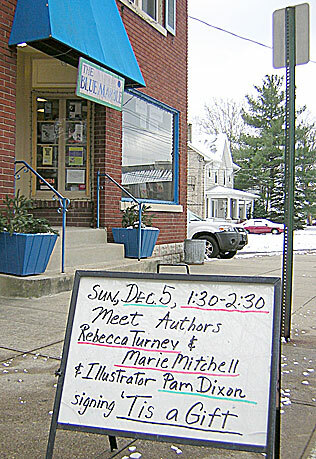 Dec. 5, 2010 - Northern Kentucky's premier children's bookstore welcomed us back for another pre-Christmas, Sunday afternoon book signing. 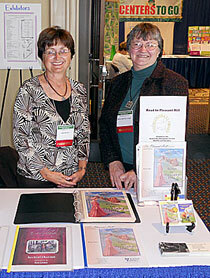 Last year we introduced Road to Pleasant Hill; this year, Rebecca and Pam presented `Tis a Gift. We were set up in the store's delightful "Goodnight, Moon" room, and the entire store was decked out with holiday decorations. We also had tasty treats for visitors, including a delicious apple cake and special brown bread made from authentic Shaker recipes. 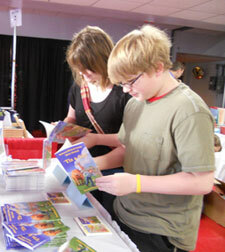 It was great meeting new friends, especially some young readers who had already read and enjoyed Road to Pleasant Hill. 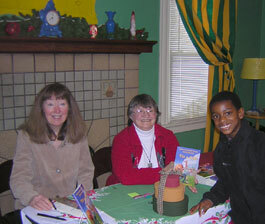 And, it brought us particular joy to have some of Pam's relatives and some mutual friends from our children's writers and illustrators group stop by to see us. 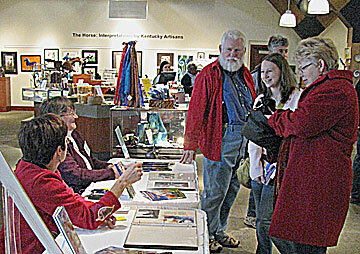 Dec. 11, 2010 - The Kentucky Artisan Center hosted a special book signing for Rebecca and Marie to mark the publication of `Tis a Gift. The Artisan Center currently stocks the works of 650 Kentucky artists and authors including both books in our Shaker series. At the recent World Equestrian Games in Lexington, the Center featured Road to Pleasant Hill among the selected Kentucky arts and crafts in its special sales area. Click here to see more recent events.